Every spring we like to host a classic book-themed after hours program to introduce teens to older titles they might not have read. It's also a chance for us to step away from Hunger Games and Percy Jackson for a beat and have a little fun designing activities around different stories. Our Teen Advisory Board brainstormed a list of about twenty possibilities in January, and we settled on the works of Jules Verne - which developed into Journey to the Center of the Teen Room. 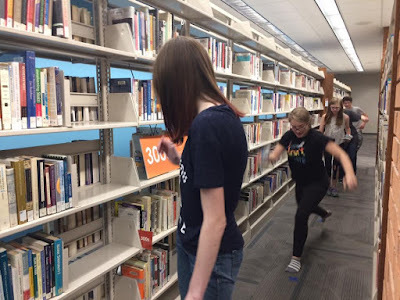 I brainstormed with Jessica (over at Book Plots & Polka Dots), our fabulous Teen Librarian, and she planned out a fun adventure that loosely followed the plot of Verne's book. She also put together this fabulous host instruction sheet for the chaperones (including answer keys). Attendees were divided into three groups following the book talk. Stop 1) Start in London - (click here for file) solve the travel poster puzzle for the Dewey location (printed on the back of the poster) where the ticket to Egypt is located. Egypt Ticket: Hint on ticket for location of next stop ex. "Find the room of study that matches your team." *This was our first time using texting to communicate with the teens during a scavenger hunt. We really, really liked it. It gave us a little more freedom to move around the building, and there was an element of mystery for the participants as well. Stop 3) Bombay, India - (click here for file) Teens found the map with the following information printed on the back : "You discover that the train track ends in Kholby, India and does not pick up until you reach the city of Allahabad! You must hire a guide to take you to Allahabad suing one of the following methods of transportation: elephant, hot air balloon, or carriage. Choose the correct method to find the ticket to finish your trek to calcutta." Call numbers were included with each method, and at the dewey location, teens would find out whether they chose correctly or needed to go back to the map and choose again. Stop 5) San Francisco - (Click here for file) Teens found another map with the following information printed on the front : "You must take the train from San Francisco to NYC, but be prepared for a few obstacles along the way. Flip this over for your first obstacle." Obstacle 1: "Oh no! There's a herd of ten thousand bison crossing the tracks delaying the train! What do you do?" Teens chose one of three solutions. Call numbers were included with each solution, and at the dewey location, teens would find out whether they chose correctly or needed to go back to the map and choose again. Stop 6) London - (Click here for file) Answer questions about time zones: 1) If it is 6pm in Japan, what time is it in San Francisco? 2) If it is 3pm here in London, what time is it in India? 3) If it is 11pm in Egypt, what time is it in NYC? This one is relatively self-explanatory. Painters tape "x's" were boulders that the teens had to jump to and there were a few obstacles along the way that were connected to the book. 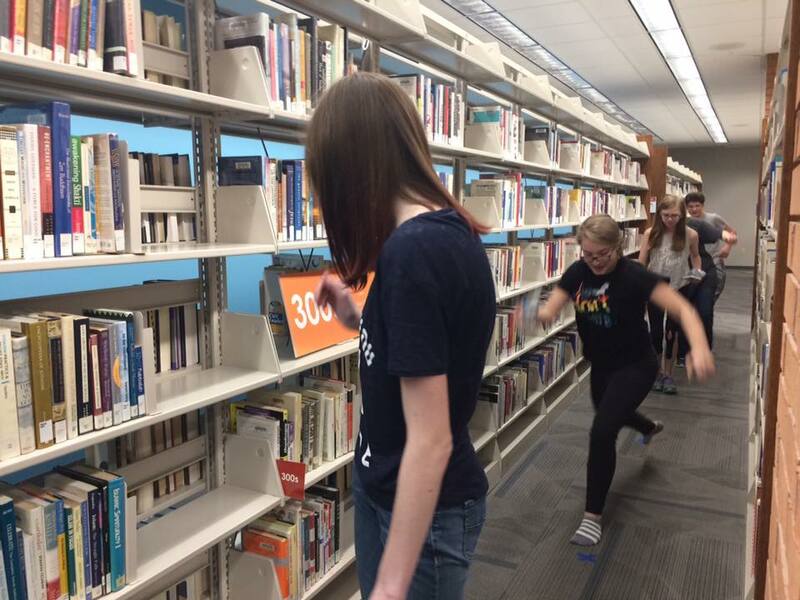 Obstacle 3) Quietly get your team through the yarn obstacle course (yarn strung between book shelves) without alerting the prehistoric animals moving about. *We divided the participants into three groups again to make things a little more manageable, and we created three different adventure paths. My group "died" five times, having to start back at the beginning each time. It was fun watching them problem solve and encourage one another. As for the crafts (links in the itinerary), the underwater globes were a HUGE success. We were glad we build in the craft time because our schedule got a little behind in the scavenger hunt (always does...). And of course, we ended the night with sardines (because, despite all of the planning, that is always the most highly anticipated activity). Overall we had a LOT of fun at this lock in, especially having our TAB president serve as a third chaperone - SO NEAT seeing him in the leadership role.